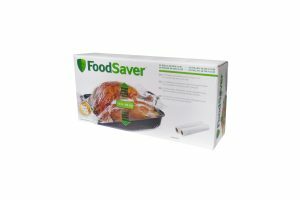 The FoodSaver® expandable rolls are the ultimate solution for storing extra large foods without cutting them up first. Seal large roasts, whole turkeys and even casserole dishes. Our revolutionary expandable bags are the ultimate solution to your extra-large food-storage needs! Now you can vacuum seal large casserole dishes, whole chickens, homemade pies and more. For use with any FoodSaver® Vacuum Sealing System, the expandable bags allow you to create custom-sized bags of any length. Built-in side pleats allow the 11-inch-wide bag to expand up to 14 inches high, easily accommodating large cuts of meat, roasts, and more!